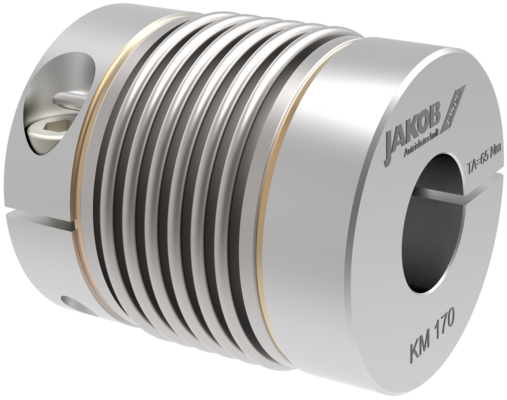 The metal bellows coupling KM from JAKOB like all metal bellows couplings, it is stiff in the direction of rotation, but flexible in the axial, angular and radial directions. Despite the similarities, however, metal bellows couplings sometimes differ greatly from each other. The technical differences are, for example, in the choice of the bellows or the connection of bellows and hub or bellows and shaft. JAKOB uses only thin-walled, multi-layered bellows made of certified stainless-steel sheets. This causes a high torsional stiffness, which ensures high positioning accuracy and concentricity even under difficult conditions, which guarantees absolutely backlash-free torque transmission between the input and output shafts. The multi-layer bellows design also causes the absorption capacity of large shaft displacements with still small restoring forces. This means an increase in reliability, safety and service life. The clamping hub of the KM is equipped with the innovative Easy-Clamp-System, which allows a simple, with enough fit clearance, sliding. The necessary preload force for torque transmission is ensured here by a single, radially accessible screw per hub. This simple and reliable connection allows uncomplicated installation in a few steps, even in confined spaces. To achieve the lowest possible moment of inertia, the hubs are made of high-tensile strength aluminum. The bellows and hubs are connected using the brass-wire press-fit method. In contrast to adhesive bonds, this joining process has unlimited fatigue life under critical operating conditions (-40 ° C to + 200 ° C, chemicals, etc.) and can safely introduce the transmission torque of each bellows layer into the hub. KM series metal bellows couplings are available with nominal torques from 0.4 to 1300Nm.